Ahh, the trials and tribulations of setting up interviews for EAR CANDY. Although we have the readership (10,000 every 4 days), we don’t have the “clout” of some of the established rock magazines like “Rolling Stone”. Plus, we have NO budget! I make most of my contacts via e-mail since those phone calls to LA and NYC can really rack up. Unfortunately, I rely on the WORD of the artist when it comes to the interview. Maybe I’m naïve to think that when they agree to an interview that they REALLY intend to follow through. You might think I’m exaggerating, but I save ALL my e-mail correspondence. First, there was Frankie Stubbs of Leatherface. He agreed to do an e-mail interview from England and said to go ahead and send him the questions, so we did. Then there was nothing, just silence. I know that many musicians are busy touring and recording, etc. so I waited a month. Another inquiry was sent and no reply. This went on for 4 months until we decided to christen Frankie into the “Gary Coleman Rock Stars”. I am the band's manager ... happy to arrange the interview. Are you familiar with the Artist's history & music? That usually helps! Email me 5 sample questions & we'll get going! Thanks Ronnie: Here's PAUL's email address – (address withheld) - drop him a line & get going. Email PK @ (address withheld) ... tell him I sent you & get it organized. So, I follow his instructions. Two more months go by and I give up on this one! Looking back, it is a good thing that I DIDN’T telephone, because then I would have had to pay for the abuse! Ha ha! Oh well, it’s not a total loss. I did get an article out of it! 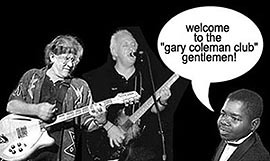 Click here to see the second installment of "Gary Coleman" Rock Stars!